Place baguette slices in single layer on baking sheet. Toss tomatoes with syrup, thyme and oil; spread onto rimmed baking sheet. Place baking sheets, side-by-side, on middle oven rack. Bake 10 min. or until bread is lightly toasted and tomatoes are softened. 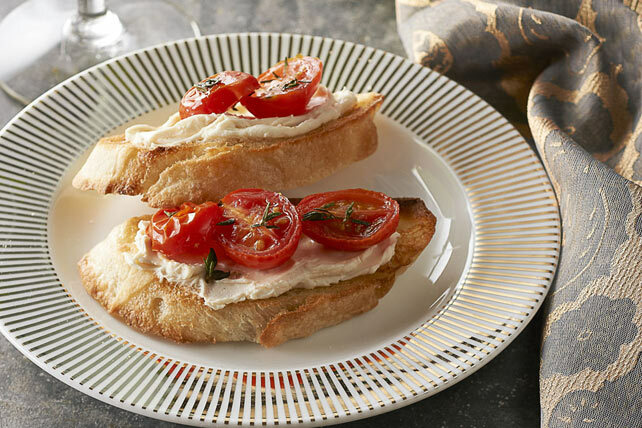 Spread toast slices with cream cheese product; top with tomatoes. Substitute 2 Tbsp. Kraft Extra Virgin Olive Oil Fig Balsamic Dressing for the maple syrup and olive oil.